Robin Emmons became an organic farmer to fight hunger. It all started when she had a small garden in her backyard in which she grew a few vegetables. From there it grew into her own nonprofit organization, Sow Much Good. Now, Robin and her two hundred volunteers grow fresh fruits, vegetables, and more for the hungry, low income families in Charlotte, North Carolina. Robin Emmons shows her kindness, determined, hardworking attitude, and her positivity, doing everything she can towards helping the families in need. This makes Robin, a true hero. Robin Emmon's heroic journey started when she was doing a kind favor for her formerly homeless brother. Robin demonstrated a simple act of kindness when she was looking out for her brother's health. "I had a small garden, so I thought, 'Well I'll just put in some extra rows,' I began making weekly deliveries." This shows her love and hope for her brother who was recently in jail. Robin's kindness grew when she quit her own job in 2008 and gave up her high end lifestyle to help more than just her brother, but an entire city. Robin dedicates her time to helping all the families that need her. She is a true model of kindness and she continues to prove it. Robin Emmons may be a kind lady, but she is not afraid of hard work. She loves seeing satisfied customers buying her food, and strives to keep everyone happy. "I decided to rip up my whole backyard and make it all a garden," showing her hard work, Robin knows how her work affects people in such a positive manor. She started off with just her self, but now has gathered over 200 volunteers to work with her on 9 acres of land. Together, Sow Much Good has grown more than 26,000 pounds of fresh, organic, chemical-free, fruits and vegetables for families who are striving for a more healthy lifestyle. Even though her former life style consisted of designer suits and a high paycheck, Robin would much rather be in the dirt, changing lives, one family at a time. Robin has a positive look on everything, helping each family as much as she can. 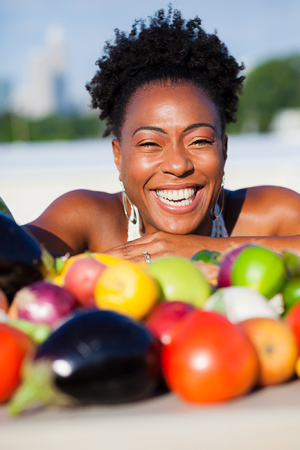 She aims to make the 72,000 low-income families of Charlotte, live a healthy and affordable life style. Not only does Robin sell her food at the lowest price possible, but she helps even more by offering cooking demonstrations, canning classes, and distributes recipe cards. Whatever she can do to help, she does, knowing it is making the families happy, and most importantly, healthy. One of the family moms said, "I couldn't believe all the beautiful, fresh vegetables, and the price she was charging was phenomenal." This shows how her happy customers react to all of Robin's hard work. Most people like the money and the the benefits towards themselves of selling things, but that's what's different about Robin. Her reasons for spending all of her time on others, is simply for their benefit. Robin felt like her, "Life was empty. I just felt like I needed to do more." Robin uses her gardening skills, kindness, hardworking attitude, and above and beyond, mindset to do all she can to help her town of Charlotte. She aims to spread her organization nationwide someday, but at the moment, she is the greatest hero to all the families counting on her in North Carolina. Robin's life is rewarding in the benefits to others, showing her heroic qualities. Robin is the true definition of hero. CNN Heroes - Robin was CNN's 'Hero of the Year', with a featured story about her. Sow Much Good - Robin's own organization that she created. People Magazine - People Magazine did a story on Robin's amazing deeds. Before Robin Emmons started gardening for the needy, she worked at a American Bank for twenty years. Robin has never looked back on quitting her job though, because now she feels as if her life has meaning. She was also originally from Boston, but now lives with her husband in North Carolina. Toner, Kathleen. "Creating an oasis in a Southern 'food desert'." [Online] Available www.cnn.com/2013/10/22/cnn-heroes-top-10-robin-emmons/. Ballard, Michaele. "Robin Emmons: Why I Quit My Bank Job to Feed North Carolina's Hungry." [Online] Available http://www.people.com/people/article/0,,20615310,00.html. Emmons, Robin. "Sow Much Good." [Online] Available http://www.sowmuchgood.org.